Britchin' Post Boutique: Me! Bath - The Number One Bath Bomb in the World! Me! Bath - The Number One Bath Bomb in the World! Did we mention, Me! Bath ice creams are soooo cute!! ME! Bath originated from the basic principle to do simple things exceedingly well. The idea for ME! Bath first started while Lisa was attending Stanford Business School for her MBA. According to Lisa, "I love taking baths at home but I was getting tired of the same routine every night. I envisioned a decadent bath and body line that could transform a mundane bath at home into a lavish spa-like experience." Benjamin, a MBA graduate with an advertising and finance background, decided to turn his wife's vision into a reality. Ten months later, ME! Bath was born. After carefully researching various scents, oils and minerals, Benjamin and Lisa developed a unique proprietary formula resulting in their signature product, Bath Ice Cream. According to Benjamin, "I had worked in product development before, and I knew that I had to create something for people that would really stand out." Instead of the typical monotonous manufacturing process, each Bath Ice Cream is individually handmade with meticulous preparation and comprised of the highest quality ingredients. Lisa and Benjamin began by selling their first product at local farmers' markets around the San Francisco Bay area. Today the entire line of ME! Bath products can be found in select apothecaries and in several high-end hotels and spas worldwide. ME! Bath has been featured in the press nationwide in numerous magazines, TV shows and online. Having made a splash in the beauty industry and redefining luxury bathing, ME! 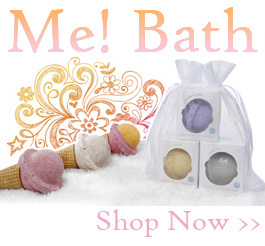 Bath is instrumental in setting the trends in high end bath and body products. Welcome to the world of ME! Bath, where we encourage you to start making ME a priority again! Welcome December Model of the Month: Riley!